Most people are aware of the dangerous sides of tobacco smoking, being an action which can jeopardize one's health quite severely. However, numerous people neglect the dangerous nature of getting exposed to cigarette smoke passively, through a process called secondhand smoking. Yet, the Center for Disease Control and Prevention reports that about 50,000 Americans die every year due to exposure to secondhand smoke. The illnesses these people died from were mainly lung cancer and heart problems. According to US Surgeon General, more than 7,000 different chemicals are found in the cigarettes smoked today, most of which are toxic. In fact, 69 of all these chemicals are known to be capable of triggering cancer by affecting the DNA of the exposed person negatively. The same research revealed that exposure to secondhand smoking leads to cardiovascular problems and blood vessel damage, making a person more prone to suffering from blood clots, heart attacks or strokes. Naturally, people who are non-smokers and stay away from tobacco smoke are more protected from these illnesses and health issues. Moreover, secondhand smoke exposure is especially dangerous for children, increasing the risk for the onset of the sudden infant death syndrome, as well as various forms of infections, along with ear and lung health problems. As far as adults are concerned, smoking and being exposed to secondhand smoke results in increased chances of suffering from cardiovascular problems and lung cancer. Furthermore, every single type of secondhand smoke exposure is dangerous, regardless of the amount, concentration or the cigarette type smoked. Due to many of these dangers, many public places have banned smoking in their areas, preserving the health of those who do not smoke. Hence, smoke-free laws increase the overall health in many countries and cultures of the world. Therefore, staying away from cigarette smoke will allow people who otherwise suffer from cardiovascular or other health problems to stay healthier. According to various reports from the World Health Organization, only a 100% smoke-free environment can truly remove the dangers of second-hand smoke exposure. Thus, it is the environment all people should opt for. The California Environmental Protection Agency agreed in a report from 2005 and added that secondhand smoke contains various toxins which reach the human body through inhalation, claiming that all people should be protected from this kind of exposure by law, since secondhand smoking is known to cause breast cancer in premenopausal women and many other forms of cancer in both women and men. Additionally, IARC, through a conducted research, came to a conclusion that, once a single spouse is a smoker, there are 20% chances that the other, female spouse will suffer from health damage. Vice-versa, the chances of male spouses suffering from adverse effects of secondhand smoke due to their smoking spouses are 30%. Among many different health issues a child in the womb of a smoker can experience, sudden infant death syndrome and low birth weight are the most prominent ones. However, once the child is born, the problems related to secondhand smoking do not disappear. Rather, they get increased in number since a child growing in an environment full of smoke can develop various cognitive and behavioral problems, including learning disorders, lack of concentration and lack of math and visuospatial reasoning. Moreover, children born to smoker mothers have lower IQ results that those whose mothers are not smokers. Also, children who experienced exposure to secondhand smoke are more likely to develop disorders such as ADHD, hyperactivity, aggression, depression and others. Asthma and other respiratory disease are more likely to appear in children affected this way, than in those who are not exposed to secondhand smoke on a daily basis. According to various statistical researches, secondhand smoking increases one's chances of suffering from metabolic syndrome, leading to excessive body fat and a variety of problems caused by this state of affairs. Also, women who are exposed to tobacco smoke for more than 6 hours a day, risk experiencing a miscarriage or becoming infertile. Finally, all the health problems due to secondhand smoking appearing in children during their fetal development or childhood may remain persistent during adulthood as well, especially in cases of asthma and respiratory problems. Fortunately, levels of smoke exposure have decreased significantly from 1988 to 2004, due to smoking bans and increased levels of awareness of the dangerous side-effects of smoking. To sum up, smoking is a dangerous habit, leading to a wide variety of life-threatening health problems. Moreover, secondhand smoking can be equally dangerous, especially when it comes to children breathing it in. Thus, in order to keep all the above mentioned health issues at bay, you are advised to avoid smoking and breathing in secondhand smoke whenever possible. 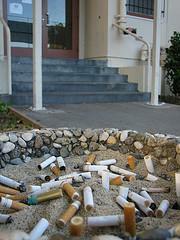 Secondhand smoke causes cancer and other kinds of diseases and deaths!